Very exciting news! Our Inn on Mill Creek mugs arrived earlier this month, and they look beautiful! 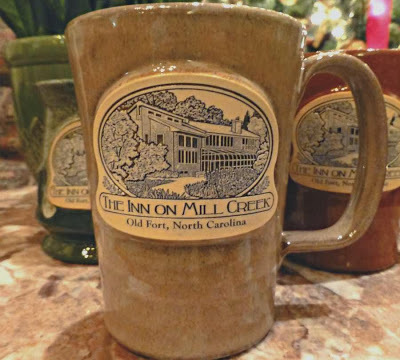 When you stay at the Inn on Mill Creek B&B, you can now sip your coffee or tea from a 12 oz. forest green or chocolate brown marble glaze footed mug or a 12 oz. Abby style cinnamon or sand colored mug. 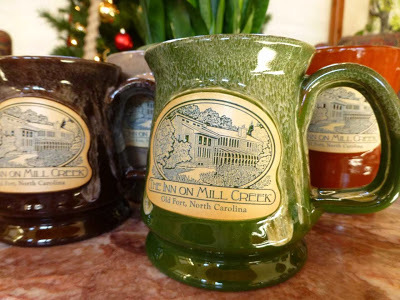 The stoneware mugs were each handcrafted from scratch by Deneen Pottery right here in the USA, and feature original custom-made artwork depicting the Inn on Mill Creek. Each piece is created by hand, lead free, and durable enough to be oven, microwave, and dishwasher safe. And did we mention, they are beautiful. We’ve already had lots of requests for mug purchases. To order mugs or if you have any questions, please contact us at info@innonmillcreek.com and we’ll e-mail you a pricing sheet. This entry was posted in Uncategorized and tagged food and drink, improvements, Old Fort / Andrews Geyser, shopping by Inn on Mill Creek. Bookmark the permalink.